We're in the midst of fixture overload, but Boxing Day is a Premier League tradition and top players are rarely rested. Sure, lineups change, but only a year ago no major players were rested as Harry Kane led the way with a hat trick, while Mohamed Salah, Roberto Firmino and Liverpool matched Tottenham's five goals with five of their own. The hope is that trend continues, with Tottenham and Liverpool in two of the more favorable matches of the gameweek. Spurs may have the best, mainly because Bournemouth have been all over the place on the road and have already struggled against top teams, allowing seven combined goals to Liverpool and Man City in the last month. Kane and Spurs are coming off a huge win at Everton and will undoubtedly be a popular place to look for captaincy. And while the Cherries are scoring, they're also giving up a lot of goals and have allowed the fifth-most shots in the league. Liverpool have been dominant at home with 18 goals scored and only two conceded in eight league matches. Newcastle have played a bit more defensively on the road with only seven goals allowed, but that also means they probably won't score in this spot, making Andrew Robertson an intriguing defensive captain. Of course, there's no reason to give him the armband over Salah, who has scored in three of his last four starts in all competitions. Firmino is getting a ton of shots, but he's still a firm level below Salah. Manchester United also have a great matchup at home against Huddersfield, who are giving up more than two goals per away match. The question is whether Romelu Lukaku enters the starting XI since he'll likely want to join the scoring fun. If he starts, this is a good chance for him to impress the new manager, but giving him the armband doesn't feel right. Then again, the Red Devils scored five goals Saturday. so this team clearly doesn't play the same as under Jose Mourinho. Jesse Lingard was the most productive at Cardiff, but Marcus Rashford had as many shots as Lingard and Anthony Martial combined (four). However, Martial had five chances created compared to two combined for Lingard and Rashford. I'll throw my money on Rashford being the best play for the armband, but there's no telling how this situation will play out, and Lukaku isn't even in this discussion. You could take the Man United route or go with teams and players who are usually easier to trust despite being on the road. Man City may have the toughest matchup after a 1-1 draw at Leicester in the League Cup last week (followed up by Leicester beating Chelsea at Stamford Bridge on Saturday), but Sergio Aguero should make the starting XI after coming off the bench Saturday against Crystal Palace. He may be the best option since it's unknown what the rest of the lineup will look like in what could be another defensive match. 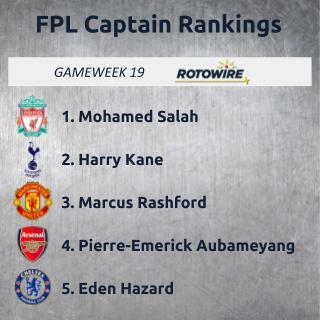 Arsenal (at Brighton) and Chelsea (at Watford) are in slightly better positions, so Pierre-Emerick Aubameyang and Eden Hazard could be considered ahead of Aguero. There have been 35 goals scored in eight away matches for Arsenal, while seven goals have been scored in the last two at home for Brighton. Aubameyang has started every league match since October, so there a few reasons to avoid him in addition to scoring a brace Saturday against Burnley. Hazard failed to make the score sheet against Leicester, but he still managed four shots and one chance created, and he had one goal and five assists in his prior four starts. Compared to last season, he's averaging 0.5 more shots, creating 0.3 more chances, taking more corners and drawing 0.75 more fouls per 90 minutes. Yeah, he's been good. There are a few differentials to turn to if you want some added fun on Boxing Day. Crystal Palace have won their last two at home (and at Man City), while Cardiff have one point from eight road matches. Andros Townsend has been the most productive in recent months and had a laser at City, but Wilfried Zaha is going to turn things around at some point and had three shots on goal against Burnley the last time he was at home. And there's always Luka Milivojevic if you prefer penalty takers. Aleksandar Mitrovic is always worth considering at home, even if the production hasn't been there lately. The worry is that Wolves have played well on the road, allowing only eight goals. Gylfi Sigurdsson or Richarlison may be better bets on the road against a Burnley team that hasn't been good anywhere and allows the most shots in the league.